ASSASSIN’S CREED ODYSSEY is a big risk. Not financially — they always seem to be sure money makers — but creatively. While Ubisoft claims the gap between Syndicate and Origins had been planned, that hiatus coincidentally helped stave off the burnout inherent to an annual series. And then Assassin’s Creed Odyssey was announced to come out just less than a year after Origins, risking the fatigue that the Egyptian entry and the sabbatical worked in tandem to avoid. Odyssey hardly improves on the previous game’s foundation and is a step back in a few ways, but it still tells an incredible, character-driven story in a gorgeous, expansive world. And what a world it is. Ancient Greece circa 431 B.C. was a beautiful place full of impressive natural sights and man-made structures that ignored the nearly three-decade-long war that was tearing through that part of the globe at the time. Death and bloodshed defined that era but just as much as the architectural beauty and human advancement that also came during that period. Odyssey reflects that anachronistic depiction with its fantastic, fitting soundtrack and amazing vistas while also representing the carnage destroying the people that lived around those vistas. The world is absolutely huge and matches or exceeds the feats Ubisoft had achieved with Ancient Egypt in its last outing in terms of scale. Although it may not be quite as unique or diverse as Origins’ setting, it’s still a wonderful place to explore from its lush greenery to its off-white mountains. Odyssey avoids the bloat associated with many other games by using its territory to establish a sense of place that most games don’t quite reach. You won’t even plant your spear on half of the terrain during the 45-hour campaign. But knowing that it is there and exploring around lends the game an incredible sense of discovery that makes you feel as though you’re always doing or finding something noteworthy. Origins also excelled in that category, which is where this game starts to break down a bit because it’s impossible to ignore how similar Odyssey is to the previous entry. Whereas Assassin’s Creed Brotherhood notably improved upon Assassin’s Creed II’s blueprint, Odyssey is heavy reskin of what came immediately before it, feeling more like a Greek filter of Bayek’s journey in another country instead of a brand-new game. It’s not even limited to the presentation, but the gameplay as well. Taking enemy encampments, exploring tombs, plundering chests, and hunting wild animals were all the staples of Origins and Odyssey directly takes many of those aspects wholesale. It is almost the exact same setup and while it worked last time to fill out the world, the ingenuity has faded a bit this second time. And none of those aspects were that inventive in the first place — we’ve all taken over a countless amount of enemy forts over the years — but they felt new for that entry. It’s understandable for a game to borrow from its predecessor but therein lies the follies of a minimal gap between entries: they’re almost destined to feel the same and not move forward quite as far as they should. But, ironically, it struggles the most when it strays away from what Origins established. Origins allowed players to play and spec how they wanted to from stealth to combat to a healthy mix of the two. Odyssey is only as open on the surface as that illusion fades as it begins to repeatedly encourage swordplay in almost every encounter. And this narrow design doesn’t always work for the player. Although it is possible to sneak around, stealth attacks are almost always dramatically underpowered even if you’re a few levels above your foes. Enemies rarely fall with one hit from your bow or blade regardless of your gear, which means you’ll eventually hit a roadblock and have to go loud. Special, powerful bow and stealth attacks help, but you’ll still hit that aforementioned roadblock because you won’t have enough meter to silently kill every guard. It’s incredibly frustrating to be hamstrung by a dull dagger since it limits your choice and heavily favors one playstyle over another. Combat can’t even support the heavy burden that the game puts upon it. Similar to Ubisoft Quebec’s previous game, Assassin’s Creed Syndicate, Odyssey is fast and more about offensive play, as evidenced by the lack of a shield or block button. Forgoing more methodical swordplay makes the combat feel mashy since you’ll be constantly slamming each attack button instead of carefully waiting for an opening. Enemies even get an annoying unparryable, (mostly) uninterruptible attack as if the game knows how pushes players to repetitively execute the same attacks. Special abilities add a welcome bit of variety but they end up being easily spammable, further adding to the monotonous melee combat. While the combat holds back the stealth, the leveling system holds back the combat and stealth. 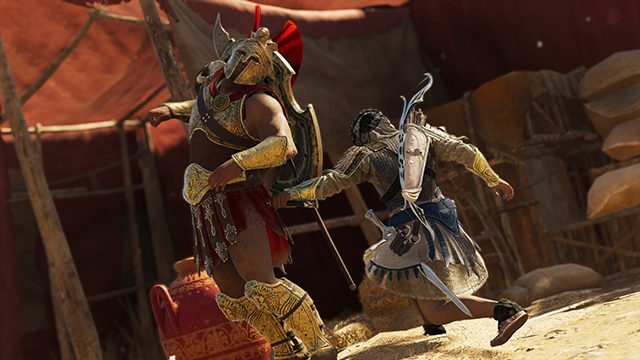 Like Origins, Odyssey is hellbent on gating off certain content from the player if they fail to grind or level to a certain point. Level caps serve as an artificial barricade that guides the player to where they should go and not where they want to go. While leveling lends the game a sense of progression, it also goes well against the freedom encouraged by the massive world and open mission design. You can’t experience it at your leisure; just at the clip plodded out by Ubisoft Quebec. Despite this, the story is excellently paced. Without saying too much, Odyssey mainly follows one of its two playable protagonists as they move throughout Greece and try to find their family. It’s simple but that ends up being the narrative’s biggest strength. Assassin’s Creed can often buckle under its own lore and cram it in wherever possible. The series usually focuses too hard on the endless “Templar versus Assassin” debacle, mediocre modern day segments, and boring, mysterious orders of old people in white robes. Odyssey takes it back a step before any of those factions were explicitly named and sparingly uses that as appropriate set dressing for what really matters: the characters that make up that rivalry. Odyssey is appropriately your main character’s odyssey and the game always keeps that in mind even as you take a detour into Greece’s political landscape. When done right, a story about family is a relatable story and this game uses that as a thematic jumping off point to talk about destiny, how we belong, and what being a family really means. 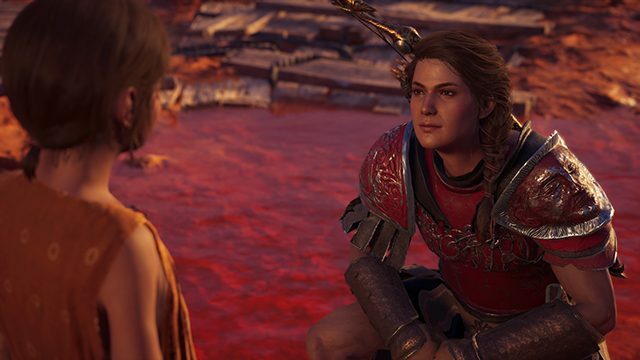 Personal stakes are far more compelling than chasing a magical, glowing ball and Assassin’s Creed Odyssey is a great example of how to tell a touching tale that lightly leverages its lore while focusing on what matters more: its characters. The cast is generally well-written and each realistically gesticulates often during cinematics, which must have been a painstaking way to keep the scenes from growing visually stale. 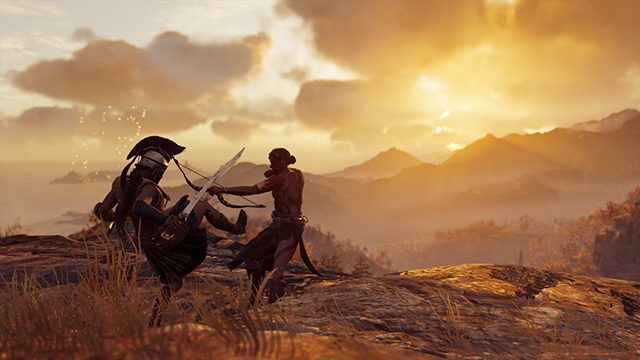 This liveliness helps keep the story entertaining but that effort is mainly spearheaded by the protagonist and, more specifically, Kassandra as she is one of the franchise’s better heroes. 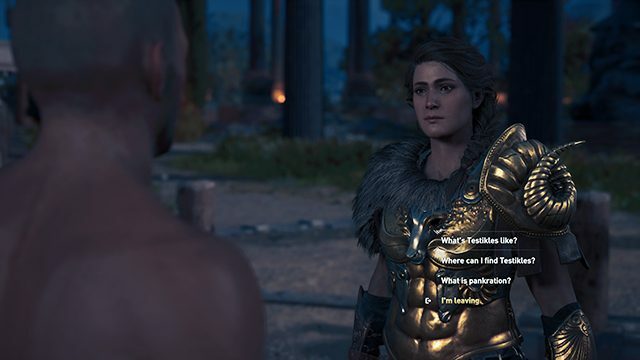 Alexios is fine, albeit less interesting, but, without delving into spoilers, Kassandra seems better suited to the story given how much more heartwarming the story when playing as a woman. She’s also a badass with heart and emotional depth and doesn’t feel like a regurgitation of Ezio, an assassin the series has been trying to recapture since his departure. Picking your protagonist at the start sets the tone for what Odyssey claims to be about: choice. This is most successfully shown in its two gameplay modes: Guided and Exploration. Guided leads you by the nose and shows you almost exactly where to go via traditional mission markers whereas Exploration gives you directional and context clues to your next objective. Characters will often tell you to go “south of the statue” or “near the coast on the east side of town,” which means you’ll have to pay attention. It feels like part of a post-Breath of the Wild school of design where developers are starting to realize that finding your own way there is more engaging than absentmindedly following a golden breadcrumb trail. While not every mission gives verbal directions and the text clues are jotted on your map, it’s a decent step forward that should be iterated on in both the series and gaming as a whole. The other choices aren’t as important. While selecting dialogue options is a welcome addition, the game doesn’t make its other, bigger choices as meaningful. Some missions do have rippling effects but, unless they are pointed out, it is usually hard to discern how the branching paths relate to each other. This is also partially encapsulated in the game’s conquest missions where you pick to fight for Athens or Sparta. 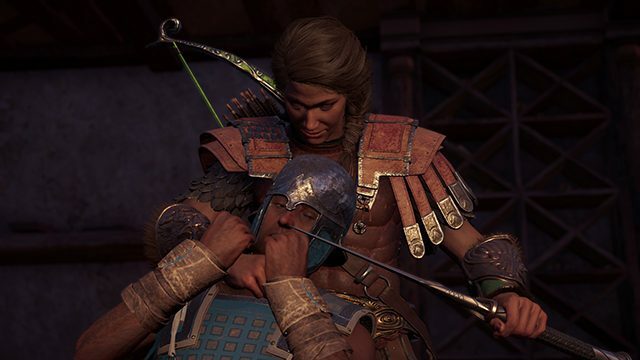 Not only is it nonsensical to fight for Athens (despite being a mercenary, your character is Spartan), it also doesn’t ever feel like it has consequences. Choices don’t need to shake the world but their foggy and sporadic implementation only serves to show how limited your options are and how inconsequential your actions seem. And one of the meta choices out of our hands is Ubisoft choosing to release another game in the franchise so soon after the last one. 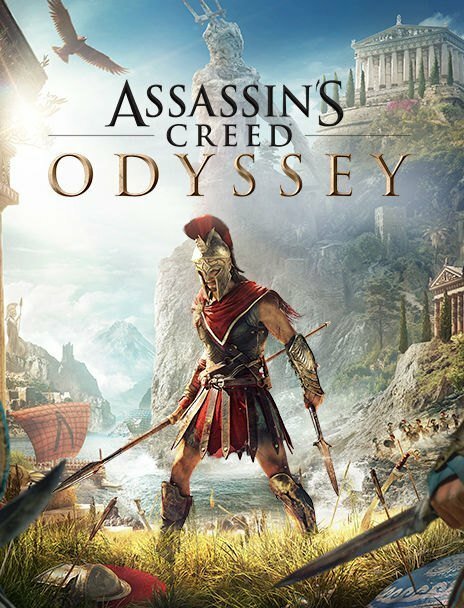 Odyssey’s mere existence seems like the manifestation of Ubisoft’s urge to churn out Assassin’s Creed titles, which is odd since the year off gave the series the fresh start and break it deserved. The quick turnaround makes this game a little creatively stagnant and is, in some ways, a step backwards from what came before. Although it crafts a wonderful narrative in an awe-inspiring world, Assassin’s Creed Odyssey, through its stubbornness and familiarity, sometimes feels like a “best of” compilation of its predecessors without being the best of them. 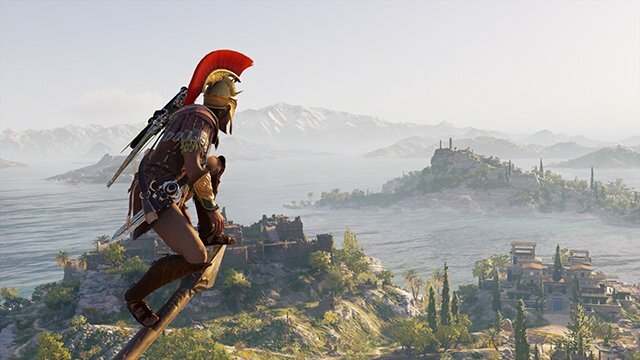 Assassin’s Creed Odyssey was reviewed on PS4 via a digital code provided by the publisher. Fantastic story with memorable, well-animated characters. A huge, wonderfully crafted, colorful rendition of Ancient Greece. Lovely soundtrack that fits the period. Exploration Mode is a great idea that should be improved upon. Stealth and bow are dramatically underpowered. Combat is mashy and is often forced upon the player. Aggressive level-gating forces that player to grind.